Raise your hand if you’ve ever bought a trinket from a trip that you almost immediately forgot about. It’s a common experience! It’s easy to breeze through the duty-free area on your way home and pick up a few (dozen) chocolate bars — and sometimes that is just the right thing to do. I’ve certainly done it myself, so no judgment there. But if you love to dig around for souvenirs and gifts that have personal meaning and that reflect what was most meaningful to you about your trip, here are some fresh ideas to bring with on your next vacation. 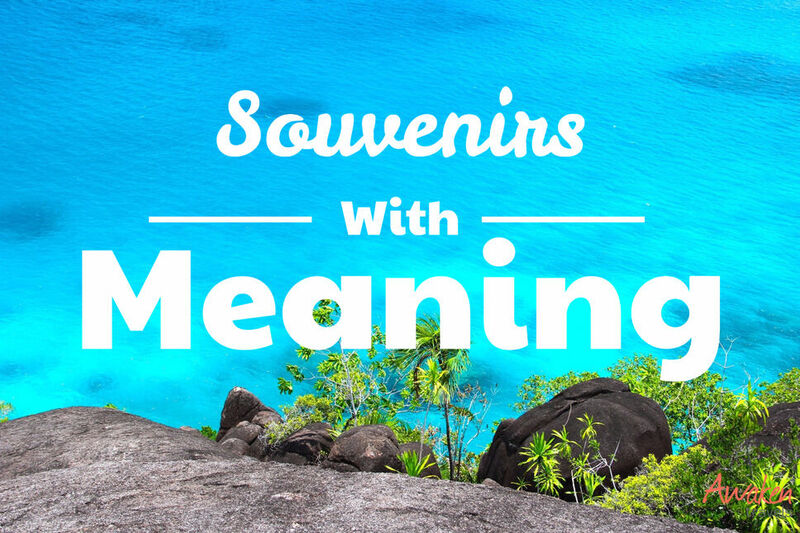 If the idea of the souvenir is that is connected to and will spark a pleasant memory, those objects often come just in our everyday interactions on a trip. Complimentary items on planes and in hotels, for example, might remind you of great service or the incredible view from your balcony. Ticket stubs, programs, interesting city maps — all these things can remind you of adventures, art, and beautiful days in a favorite city. Of course bearing in mind specific laws regarding transporting plant material across borders — there are natural objects that can mean much more than anything purchased in a store. A flower petal or leaf pressed in a book, a beautiful unique pebble, a jar of sand or sea salt — these are simple things that can be incorporated into your décor at home that will make you smile every time you see them. If you’re buying for yourself or for someone else, consider something that will offer an inside view of the culture, language, history, music, or food of where you’ve visited. Laura Palmer Peach of Kaufman Mercantile reminds readers that it’s okay to inquire at restaurants or bars or coffee shops if you can add the price of a dish to your bill. So if you’ve had a particularly wonderful experience somewhere, share that enthusiasm with the waiter and ask if they’d be okay with you buying something to take home. Imagine sipping your morning tea or coffee from the very same cup you sipped from in Paris. What could be better? One of the best adventures in a different place can be to scour antique shops for quirky treasures. If you have a reader in your life, a gorgeous old book might bring immense joy. Vintage postcards or photos can be a collector’s dream. Jewelry, scarves, cuff links, bags — these all give a glimpse into style and history and make a statement, and they don’t need to be fancy or expensive. Plus, you’ll have a great story to tell with every compliment you receive. If you’re going for something new, consider a practical item — something you can use in your everyday life that will bring happy memories. Ms. Palmer suggests that an umbrella or a nice bag can be a great option. If you love to cook or bake, perhaps a cooking tool or recipe book would be just the thing. Even a small musical instrument can be a great gift for kids — a flute or shakers, for example. One cool thing about smart phones is that you have instant access to a world of creative sharing. Even if you don’t use your phone while you’re away, it can make a wonderful, portable, decent-quality camera — and when you return, those photos can be easily turned into souvenir books for yourself, family members, or friends. ChatBooks is a free app that allows you to effortlessly create and customize photo books from Instagram, Facebook, or your regular photo library for as little as $8. Whatever your tastes, there are tons of ways to approach the idea of a souvenir that ensure you’ll bring something back that will have personal meaning for you and that will spark many wonderful memories months and years after you’ve come home. And don’t forget the chocolate bars on your way out! If you’re ready to start your own hunt for the perfect souvenir in the perfect getaway, email me today and let’s get started! You can reach me by clicking here.